The Board of Supervisors approved a resolution to adopt the Community Strategic Plan. On July 19, the Board of Supervisors held a work session to discuss recommended edits to the draft Community Strategic Plan. The Community Strategic Plan Annual Reports below highlight the significant projects and accomplishments which contribute to the realization of our goals. Provides a framework for policies, operations, and service delivery decisions. 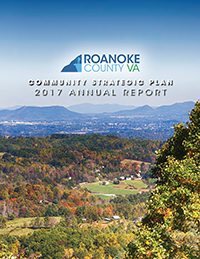 Creating the Community Strategic Plan is a process that required active participation from Roanoke County’s community leaders and citizens. During the process there were many opportunities for citizen input and public comment before the final plan was adopted by the Board of Supervisors. In the fall of 2015, the Board of Supervisors approved moving forward with developing a Community Strategic Plan. 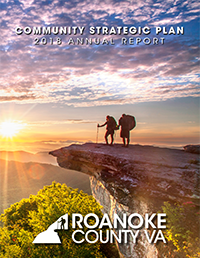 Over the next several months, citizens and community members will come together with the Board of Supervisors to create a five-year plan for Roanoke County. In the fall of 2015, Roanoke County contracted with Roanoke College’s Institute for Policy and Opinion Research to perform a random telephone survey. The survey questions included what Roanoke County citizens think are the most important strategic issues facing the County over the next five years, along with rating the importance and quality of public services the County currently offers. The survey results will be used to help citizens understand community-wide issues and concerns that affect the strategic direction of the County. >> See our TELEPHONE SURVEY RESULTS page for survey results and more information. The Board of Supervisors held a retreat on January 30, 2016, at the Vinton Branch Library devoted to several items related to the Community Strategic Plan process. Dr. Harry L. Wilson, from Roanoke College's Institute for Policy and Opinion Research, was at the retreat to present his findings and a report about the survey results. For more information and to download a copy of the report, see our TELEPHONE SURVEY RESULTS page. After reviewing the results of the telephone survey, the Board of Supervisors created a Vision Statement that will help guide the future of our community. This Vision Statement reflects the desires expressed in the community-wide survey. that values its citizens, heritage, and quality of life. At the January 30, 2016 retreat, the Board of Supervisors also determined broad topics to be addressed by Focus Groups this spring. The Board's approved focus areas are Community Health and Well-Being, Economic Development, Education, Public Safety, Quality of Life, and Transportation. Citizens were encouraged to participate in collaborative Focus Groups that worked with Board of Supervisors members and County staff to help shape the Community Strategic Plan. Focus Group meetings were open to the public and interested citizens were encouraged to attend and participate in the meetings.Residents who signed up in advance for focus group meetings were assigned to Focus Groups that best matched their interests as space allowed. Information and updates about these focus group topics was sent via email to these individuals. >> See our FOCUS GROUPS page for more information, including dates and locations of Focus Group meetings. Most Focus Group meetings were hosted by a Board of Supervisors member, with the exception of the Education Focus Group which was hosted by the Roanoke County Public Schools Superintendent. All meetings were facilitated by County staff. The purpose of the Focus Group meetings was to establish goals and measurable objectives to be achieved by the community in the coming years. Focus Groups met four times this spring, beginning the week of February 29. Focus Group meetings were open to the public and interested citizens were encouraged to attend and participate in the meetings. Residents who signed up in advance for focus group meetings were sent information and updates about the Focus Group topics via email. >> See our FOCUS GROUPS page for more information. From the Focus Group discussions, a draft Community Strategic Plan was developed and published for additional public comment. Two community meetings were held to receive additional comments on the entire draft plan. Public comments were received until July 5, 2016. 3 p.m. to 5 p.m. and 7 p.m. to 9 p.m.
>> See our PUBLIC COMMENT page for more information. The Board of Supervisors held a work session to discuss recommended edits to the draft Community Strategic Plan July 19, 2016. A public hearing to receive final input on was held August 9, 2016. The Board of Supervisors approved a resolution adopting the Community Strategic Plan at its August 9, 2016 meeting. 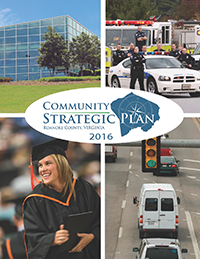 The final Community Strategic Plan will guide the future of Roanoke County for the next several years. For more information about the community strategic planning process please contact Dan O'Donnell, Assistant County Administrator, at (540) 772-2017.